I don't know enough about the subject matter addressed throughout this article, especially the history of Mexico's politics to offer to many criticisms, but his analysis of peasant societies is really off the mark. The author states that peasant society "shows the high level of internal stability and resistance to outside influence: not so much an example of poor peasant and political commissar vs. rich peasant, as rich and poor peasant vs. political commissar." This is rather ridiculous statement. The author obviously has done no research of any ethnography of peasants in general or the Mexican peasantry in particular. Peasant society indeed has a great deal of pre-capitalist social formations but this does not mean that history does not exist with these people. This includes resistance to exploitative outside interests as well as inter-community hierarchies. 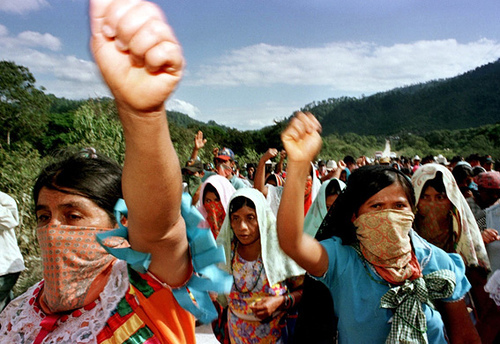 That the Zapatista movement could be a reaction to both does not occur to the author. To be fair, I'm not sure the article argues that...if anything I think it's quite open-ended in its conclusions. It's also from the year 2000, which means it doesn't take into account stuff like the Sexta Declaración (which is more explicit and actually mentions capitalist social forces in some fashion). I for one don't think it pays due attention to the tensions between liberation theologists and the Vatican. yes at first they attempted to incorporate it within the Catholic mainstream but there were a series of conflicts and splits which led to many expulsions and many liberation theologists rejecting the Vatican, and even organised religion as something hierarchical. This is really important when dealing with the Zapatista approach to faith, which consists essentially of animistic Mayan beliefs with the Virgin Mary superimposed on top! No mention is made of this in the article. If you wanna attempt to make a political point about the contradictions between the EZLN and Catholicism, then it has to be explored in greater depth. The contradictions abound: believing in a classless society, catechists are unable to break with a church whose very essence is hierarchy and authority. rome doesn't perceive the possibility of its own dissolution in anything. it certainly doesn't want to retreat where it has advanced, but that's not the same thing. by reading religion politically critics like aufheben will continue to get half the story.